And more than 670 hp. It’s called "Project Portal," and it was formerly top secret. Until now. Toyota has released details about a hydrogen fuel cell system specifically designed to handle heavy-duty truck use. One of the chief goals of the project was to have a zero-emissions solution for heavy-duty applications, like for the semi-trucks hauling cargo from the ports of Los Angeles and Long Beach. Essentially, the Project Portal platform was designed to handle the requirements of port drayage operations, and Toyota already laid the technical groundwork with the Mirai. But the truck has a lot more power, obviously. 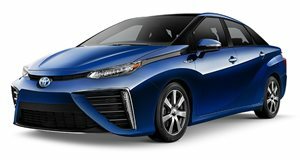 It generates more than 670 hp and 1,325 lb-ft of torque thanks to two Mirai fuel cell stacks and a 12 kWh battery. That’s actually a fairly small battery to support what’s classified as class 8 load operations. Toyota has already built the concept, and its gross combined weight capacity is 80,000 pounds. Toyota estimates it has a driving range of more than 200 miles per fill, under normal drayage operation. What’s interesting here is that Toyota is continuing its hydrogen fuel cell development beyond regular passenger cars. But then there’s Tesla, who recently announced that it’s busy at work on a semi-truck of its own, a pure EV that’s said to debut this September. As for Toyota, it hasn’t announced when (or if) a production version of its hydrogen semi-truck can be expected. For now, it’s simply in the prototype phase, but many local officials are thrilled about Toyota’s effort. "As they did with the Prius and the Mirai, Toyota is taking a leap into the future of technology. By bringing this heavy duty, zero emission hydrogen fuel cell proof of concept truck to the Port, Toyota has planted a flag that we hope many others will follow," stated Mary D. Nichols, Chair of the California Air Resources Board (CARB).